Way back in the days of Gigli, Daredevil and Jersey Girl there was a struggling young actor named Ben Affleck. He had his taste of stardom in Armageddon and Good Will Hunting but seemed to have peaked as an actor early in his career. He had become the laughing stock of Hollywood and nearly everyone was dumping on his performances. In 2007, something strange and promising happened to Affleck. He decided to get behind the camera (Gone Baby Gone) and try his hand at directing. With a strong follow-up in 2010's The Town, Affleck had slowly turned around a spiraling career and now sits on the precipice of Oscar glory with his latest effort, Argo. Argo is a drama based on a true story of a US/Canadian special operation designed to extract 6 American hostages from the Canadian Embassy in Iran during the height of the Iranian Hostage Crisis of 1979/80. Affleck directs himself in the lead role of Tony Mendez, a CIA technical operations officer who comes up with a grand scheme of using the backdrop of a fake Hollywood movie to serve as a cover story for the extraction process. He meets with experts in the industry (played by the always welcome John Goodman and a sharp-tongued Alan Arkin) and plans out a screenplay, storyboards and fake production team credentials to help sell the story. Supporting the extraction effort are a group of CIA operatives featuring strong performances by Bryan Cranston and Kyle Chandler (who continues to try to escape the typecast of Coach Taylor from Friday Night Lights). Affleck once again is a hit as a director in Argo, using tight emotional shots to convey the several gripping and tense scenes that play out during the complex extraction process. The production value of setting the 70's tone with costume and set design is incredible. We get to see some excellent fake hairstyles and moustaches and some authentic 70's/80's television broadcasts. The movie really does feel like it was shot decades ago and kept on a shelf before it's release this year. You can really tell the quality of the production design when a side-by-side reveal of the real individuals in the film are shown next to their portraying actors in the end-credits sequence. As an actor, Affleck is serviceable playing Mendez' character as a sympathetic calculated individual who doubts whether his plan will succeed at time but always believes in it. His supporting cast is tremendous and we really do see the brilliance of Cranston in some very tense scenes. It seems that he has a fine movie career ahead of him after his days of playing Breaking Bad's Walter White are over. Argo will most likely be nominated for several Oscars as this seems to be the type of movie that the Academy will embrace wholeheartedly. My main concern with the film is that it seems as if a little too much Hollywood gloss was added to the true story of the extraction. There are moments during the final sequence at the Iranian airport when event occur so close to one another that it seems way too conveniently placed to add drama to the story. This is more of a nitpick if anything as the timeline of the movie works effectively well in bringing a large dose of tension to the big screen. 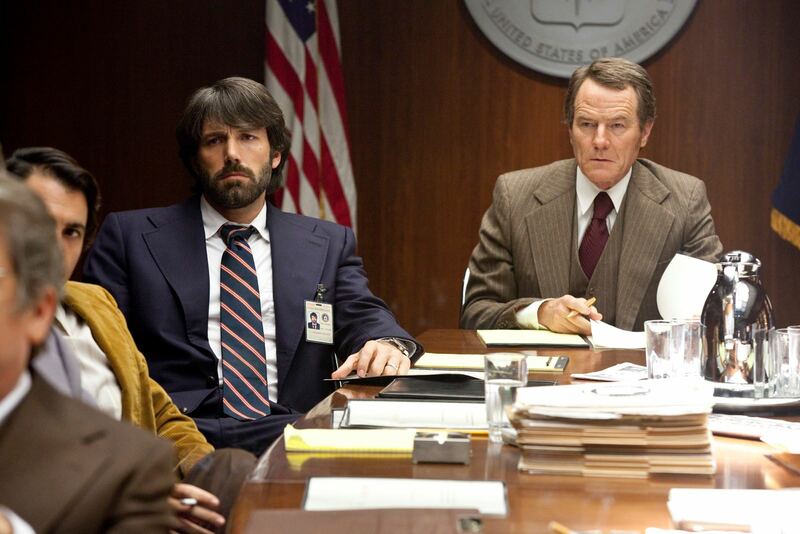 Go see Argo in theaters and prepare for a tense and wonderfully acted and directed slice of historical cinema. A very solid 4.5 out of 5 JRs for one of the best movies of the year. Not a perfect movie, but a very entertaining one at that and I have to give Affleck a lot of credit for going out of his comfort zone, and really tackle a story not many people know about. However, the problem is that we all know how it ends. Good review Jordan.